To celebrate the upcoming launch, I wanted to share the first chapter of the book with you. I think runners and yogis alike will really enjoy the book. Every year, the Chicago Marathon is a reminder of my hardest running moment: having to quit the 2012 Chicago Marathon at Mile 14. It was my second marathon and I wanted to run a PR. So, I upped my weekly mileage, peaking at 65 miles a week. I left parties early on the weekends so I could get up the next morning to train. I lived, breathed, and slept marathon training. I did everything a runner training for a PR should do—or that I thought they should do. (This was before I became a running coach.) I did speed work. I did tempo runs. I tracked my food intake to make sure I was eating enough protein to support my muscles. I wore compression socks all day after my long runs. I even became BFFs with my foam roller. Training was going great…until my taper. During my second-to-last long run, I felt a pain in my right hip flexors, the muscles in the front of my right hip. I tried running through it, but couldn’t. I freaked out, but was slightly relieved when my doctor cleared me to try to run the marathon. I didn’t run for the rest of my taper, hoping that taking some time off would let my body heal. Fast forward to race day. I felt great for the first few miles. Then, the pain started creeping back. I tried not to freak out, but it was hard. I’d trained for months for this race. I’d run more miles every week than I ever had before. By the halfway point, my hip flexors were hurting so badly that I couldn’t run and I could barely walk. I knew I had to stop if I wanted to protect my body and keep running in the future. I burst out crying when I realized my dream of a personal best marathon time was gone. Countless hours of running through the summer heat were just wasted because of a bad injury at the worst possible time. It took me weeks to recover emotionally, and even longer to recover physically. When I got home, I started the process of healing, and fixing my body so I could be a healthy runner again. Through months of physical therapy, I learned the ultimate culprit of my pain: weak glutes. And they were weak because I’d been skipping out on my yoga because I was busy running and writing my doctoral dissertation. I thought I was too busy for yoga. Yes, it had helped me train injury-free for multiple PR half-marathons, as well as my first marathon. Yoga helped my body stay healthy through the 50-mile training weeks that I used to power myself to a sub-4-hour marathon finish. But, I got cocky. I thought that I’d gotten enough out of yoga and that I could skip out of my usual classes and still stay strong. I was wrong. So wrong that it cost me months of training, not only running, but stretching, foam rolling, tracking my food to make sure I was eating the right nutrients…all of that preparation was wasted because I temporarily gave up my yoga practice. I tell the story of my Chicago Marathon experience to demonstrate the power of yoga and how it can make you a better, stronger runner. The immediate take-home message of this story is how yoga can help you (and absolutely helped me) prevent injuries. Yoga is a fantastic way to keep your body strong. It strengthens the muscles that help stabilize your body so you can run injury-free. What this story also shows is the power of yoga to help you stay in tune with your body. 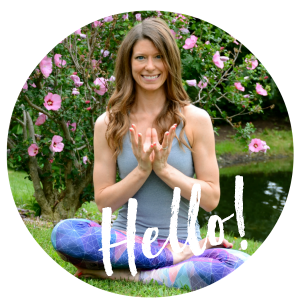 Chances are, if I had still been going to my yoga classes two to three times a week, I would have been more in tune with what was going on in my body. I would have noticed that I was feeling weak in certain areas. And, I absolutely would have noticed tightness and soreness in my hip flexors, the first signs that I was headed for injury. When most runners think about yoga, they think about stretching, and maybe getting in some core work. Yoga is about so much more than that. Yes, yoga will absolutely help you with flexibility and mobility, physically. But, it will also help you become more flexible and agile mentally. Yoga will help you learn what your limits are, and how to listen to your body so you know when you can push a little further. The beauty of yoga is that it’s a practice that actively encourages you to get in tune with your mind and your body. It does so much for your body and your mind, and all in one session. It not only makes you a better, stronger runner; it makes you a better, stronger person. 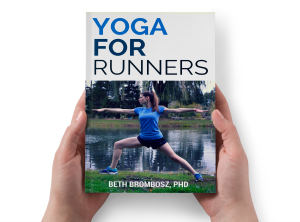 Throughout this book, you’ll read stories and examples of how yoga can make you a better runner. When you’re on your own mat during your own yoga practice, and when you’re out on the road or on the treadmill, I encourage you to try these strategies. Each chapter focuses on a particular theme, a tool that you can use to become a better runner with yoga. Be sure to take the time to think about how you can apply what you learn in this book to your own yoga practice and running. I can’t wait for you to read the entire book! Please don’t forget to sign up to get alerts, to get details on how you can get your copy of Mat to Pavement for FREE, and to get more details about the launch giveaways when they’re announced! Aww, this is so awesome! Congrats on your book! I really need to do more yoga! SO MANY BOOKS. Haha congrats! Thank you! I’ll tell you a little secret: the Kindle version will be free on January 2nd, so if you think your book club members might want to read it eventually, tell them to grab a copy then!